I literally get giddy every time I see a new episode pop up on my feed. I love this podcast so much. So funny!!!!!! One of my favs but it disturbs me that Grahm has an English degree and doesn't seem to understand so many words.Wouldn't change a thing, guys!! I look forward to new episodes always!!! If you want to be entertained & laugh til you cry definitely listen!!! Say What is a must listen to every week! (when they release it). They are very funny, great news articles, Graham logic and the Tom vs Chase. Production value is great and should be on your playlist. Never miss an episode. Great show great guys gets better every week. A very fun and entertaining show with above average audio quality! It's hard to find good podcasts that are actually funny, this one is a diamond in the rough. A Hilarious Show! My Top Ten! These guys are three of the funniest dudes I've heard and I spend ALOT of time listening to podcasts as a Truck Driver! The chemistry of Tom, Chase and Grahm makes for an hour full of laughs and great stories and will leave you chomping at the bit for their next installment! There are a lot, and I mean A LOT, of podcasts begging for your attention. Most of them are garbage. Poor quality and babbling. Some are descent but lack in other areas. Then there are a few that are the total package and always leave you wanting the next episode. This is one in the exceptional category. Download and enjoy. My whole family loves to listen to these guys, and most of there stuff is PG and knee slappin hilarious. Tom, Chase, and Grahm have great rapport and are really entertaining! I love a good ramble-cast and âSay Whatâ doesnât dissapoint. I needed a new podcast to enjoy now that Serial was over (and no, this is nothing like Serial). I came across this and decided to first listen to an older episode, and they had me at #thinspiration. I remember when that broke in the news and finding it to be ridiculous and these guys were saying everything I had back then. Once I knew that the humor matched up, I downloaded some more and gave it a go. I truly enjoy the banter between the hosts and the news stories that they choose to cover. I know this show is something I will be listening to as long as they continue to make it! This podcast is sure to make you laugh. It's light-hearted approach to humorous new stories along with enjoyable hosts and trivia keep me coming back each week for more. A great show, with nice energy and flow. They are not afraid to talk anything, and do it in a funny and fresh way. This is worth listening to! If you want to have fun, you NEED this show on your playlist! I tried 3 episodes months ago and didn't like what I heard. Decided to give them another chance...While it has improved there are better ways to use time and bandwidth. Try Uhh Yeah Dude podcast (mucho betterness) Peace! Pretty good podcast. Cut the low playing background music. It plays the entire episode. Not needed guys. Keep up the good work. It seems like just three kids given time on their college radio station to tease each other and make bad jokes about the most unorginal, adolescent subjects. I see every review so far has five stars and lots of positive descriptive words, but what is the point? Why would I want to listen again? There is nothing original about this podcast. 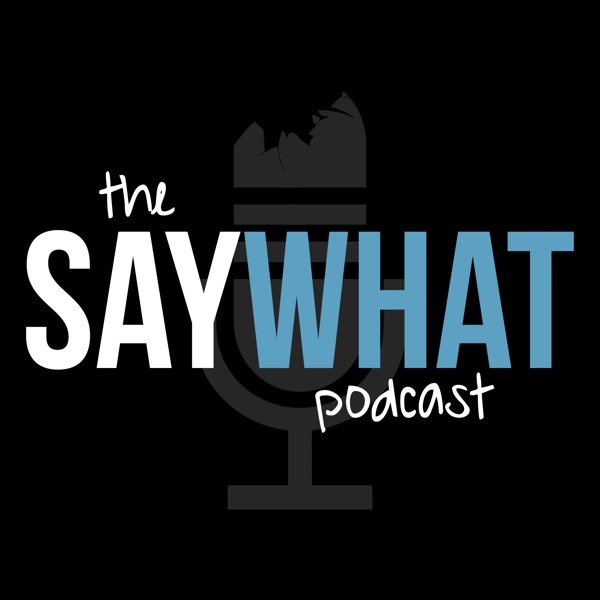 In fact, there are several other podcasts called "say what?" on iTunes. It is impossible to find in the search bar by title. loving it! these guys are great, hope they keep it up! Enjoyed this podcast immensely. Funny and witty. The hour flies by. Great production value. Keep up the good work! Funniest hour of my week. Great production with hilarious, bizarre topics. Worthy a weekly download. Tell your friends, enemies and everyone in between. Great podcast. These guys are hilarious. Tell your friends!! I once watched Tom dropkick a newborn puppy and I still find this a great listen! Reccomend this to all of your friends!